I think most everyone in business has heard of Quickbooks. It’s the big daddy of accounting software for small to mid sized businesses. I use Quickbooks to keep track of my business and, while it may be overkill for my type of business, I find it extremely powerful. When running a business you must keep accurate book. Specifically for tax reasons you need to have everything accounted for and categorized. While there are many methods for doing this ranging from a paper ledger to spreadsheets programs to a shoebox full of receipts there are too many good apps out there today to continue using outdated methods. Quickbooks Mobile is available for Android and iOS and is free for Quickbooks Online users. If you use Quickbooks 2011 or 2012 (not Online) then you need a paid subscription to use the mobile apps. • Billing tool with unlimited invoicing on the go! One of the big draws with Quickbooks Mobile is the ability to generate and email invoices on the go. This can speed up the time it takes to get paid and that is a good thing. Lets say I am on site with a client and had a day long training session with their employees and performed routine maintenance on a server. Using Quickbooks Mobile, I can pull out my iPad or Android phone and generate an invoice. I then email it to them and it’s done. I can’t tell you how many times I have forgotten to generate and send an invoice and it was a couple of weeks before I even sent an invoice to the client. 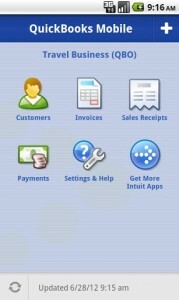 Estimates are another nice feature of Quickbooks Mobile. I can picture having a meeting with a client regarding a new project then while things are fresh in your mind creating and emailing the estimate right there in the office. 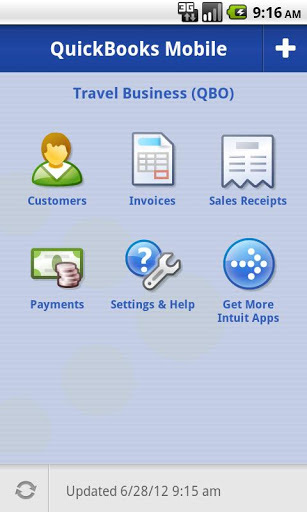 There are many other features and Quickbooks Mobile appears to be a solid application and if you already use Quickbooks online then it’s free so why not give it a try.